Gartner recognizes Salesforce as an industry leader. 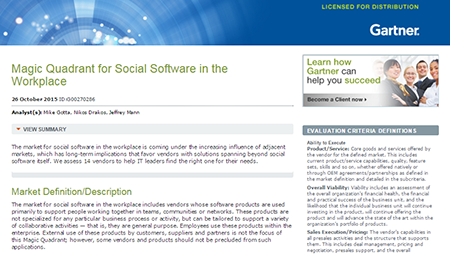 See why Gartner named Salesforce as a leader in social software in the workplace. Get the full story of how Salesforce’s vision, integration capabilities, and viability have set us apart. Gartner “Magic Quadrant for Social Software in the Workplace” by Mike Gotta, Nikos Drakos, Jeffrey Mann, October 26th, 2015. This graphic was published by Gartner, Inc. as part of a larger research document and should be evaluated in the context of the entire document. The Gartner document is available upon request from Salesforce. Gartner does not endorse any vendor, product or service depicted in its research publications, and does not advise technology users to select only those vendors with the highest ratings. Gartner research publications consist of the opinions of Gartner’s research organization and should not be construed as statements of fact. Gartner disclaims all warranties, expressed or implied, with respect to this research, including any warranties of merchantability or fitness for a particular purpose. See why Gartner named Salesforce among those leading the way in social software in the workplace.